Please complete the attached form and turn it in to Mrs Brook. This $500 scholarship, Mallie Gayle Smitherman, is for BCHS graduates (up to age 25) or current BCHS seniors. They need to apply online at malliegayle.com before March 31, 2019. Please see attachment. Power UP, Central Six AlabamaWorks!, Wood, Girls Inc. of Central Alabama, AIDT/AWTC, and the Academy of Craft Training present the 4th annual Power UP: It’s a Mother-Daughter Thing! The event will be held on March 12, 2019 from 5:30pm-8:30pm at the Alabama Workforce Training Center (AWTC). The first three years have been tremendously successful with over 800 attendees, employer partners and training providers. Our fourth annual event promises to educate, engage and encourage more mothers and daughters to explore career opportunities in the construction industry. Feel free to visit the Power UP website: http://www.poweruploud.org for more information about the Mother-Daughter Thing event and other Power UP programs. 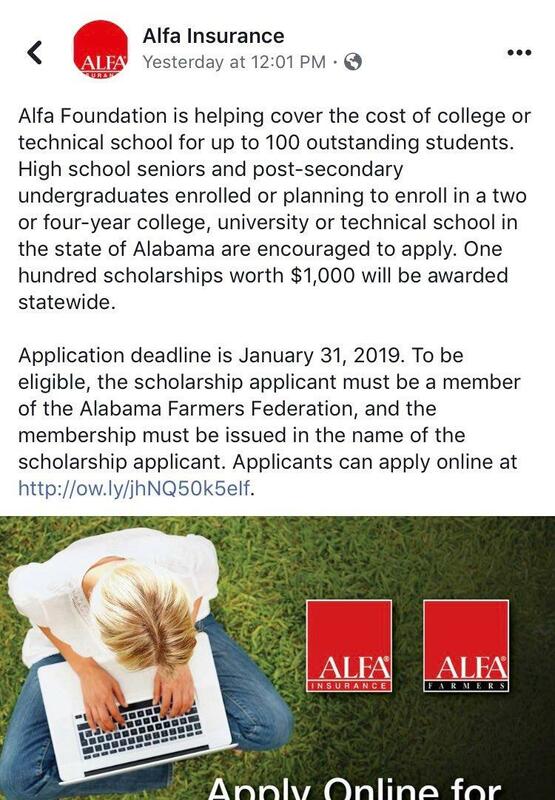 Alabama Home Builders Foundation Scholarships! Spring parent visitation day is scheduled for Tuesday, February 12.